Several of us sat in to listen to the monks chanting morning prayers in the Gompa. The ridge above it is festooned with prayer flags and little stupas and clay ovens for burning the incense from the juniper bushes during festivals. There was a fantastic view back down the valley we’d climbed the day before and across to Khundre village on the far side. Everywhere there is much evidence of food being dried for winter: woven bamboo nanglos full of drying mushrooms, carrots, ginger and entire large mats covered in grated potato. Many farmhouse courtyards are festooned with leafy greens being dried as animal feed for the winter. It was a long walk, made longer by a bridge being washed away across the Dudh Kosi below Panboche, so we followed an alternate route along the right-hand bank, about an hour and a half longer. At first we traversed the eastern side a hundred metres or so above the Dudh Kosi, through moist forest dripping wth moss and lichen. We climbed down to the junction with the glacial melt river from Ama Dablam through pine and birch forest to scramble along the boulders beside the river. At this point we were opposite Pangboche and could see the landslides that are slowly eating away the shelf on which the village sits. A short climb up a rocky slope and a traverse brought us up and over a ridge and back into the Dudh Kosi valley. 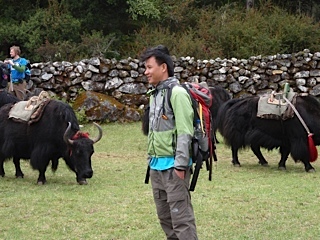 We soon came across amazing yak enclosures with many low dry stone walls dividing different close cropped pastures. The bridge on which we eventually crossed the river was itself threatened by a massive boulder, just waiting to crash into the river. Its size is so great that its fall will change the flow of the river and carve out the near bank, taking with it the rock bunds that anchor the suspension bridge on that side. After a steep climb we were above the tree line, and trekked up past yaks and horses grazing in the mist. After we topped a small rise with mani walls and chortens, we dropped down into the long broad valley of Dingboche, a fertile shelf about 800 by 300 meters wide beside the rushing river. The carefully tended fields, delineated by more dry stone walls, have been farmed for generations. However people don’t live here over winter, only coming up after spring and the monsoon to harvest potatoes and buckwheat and cut the long grass for winter fodder. We are high here – over 4000 m – and walking is slow. At Dingboche we had another rest day to acclimatize. This time we climbed straight up to a mani wall and white prayer flag about 500 metres above our Peaceful Tea House. Tomorrow will be a long day, about a 7 hour walk to Lobuche. We are only three nights from Everest Base Camp. This trip is going too quickly! This entry was posted in Activism, Climate change, Environment, Foreign aid and development and tagged activism, AYCC, climate change, environment, Nepal by Philippa Rowland. Bookmark the permalink.